Posted 18 October 2013 & filed under 1930s, Post World War 2, Streets, World War 2. Tavistock Avenue was once part of Doggetts Road. 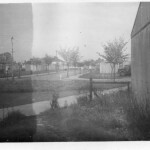 Then it was called St Julian’s Farm Estate on East Road, while the houses were being constructed, as the land was also part of the St Julian’s estate. The land was sold in 1932 to Vesta Finance and encompassed all the land above the footpath between the top of Doggetts Way and Wilshere Avenue before it joins Watling Street. Not all of Tavistock Avenue was included in this parcel. It appears to end at the footpath further up (by number 59). The houses in Tavistock Avenue were built in 1934. The end nearest Doggetts Way had garages integral to the houses but not so the other end. Mrs Olive Cooper, who lived in number 21 from when they were first built, maintained that this was because the builders ran out of money. Tom Edgar’s future wife, Valerie Millman, lived at number 7 Tavistock Avenue, which is on the left hand side coming up from Doggetts Way. The Millmans lived there from 1937 until the 1980s. Most of the houses were rented and they paid £1 per week. Tom remembers that beyond the gardens at the back of Tavistock Avenue it was mostly hawthorn scrubland in fields where there were cows. On that side of the avenue, there was, and still is, a footpath at the back. Alan Lawson moved to 26 Tavistock Avenue in 1935 when he was 3. “There was only open fields behind us then. My brother Brian was born in 1937. Mr & Mrs Saunders were in No.28 with their son William and the Hemmings with their son Jeffrey were in number 24. 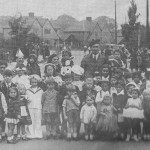 There were a lot of kids in the streets then, Jamie Grigsby, who had David Croucher as an evacuee, Keith Morcome, (all in Vesta Ave) Raymond Poll, Valerie Millman, Gillian, Jennifer and Ruth Coker, Barbara and Derek Harry, Alfie Taylor, Roy Shepherd, Brian Galliers, Basil Saville, Marion Robertson, Ann Hooper, Sylvia Webley and her sister, Billy Saunders, Margaret and Christine Palfrey, Leslie, Pat and Peter Baines, Roy and Tony Cobb, Alan Parish, Pam and Joyce Berry, Jack Dowie. 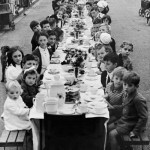 There are others I can picture but can’t remember names.” Alan is pictured below in the in the VE day street party picture (with the table) where he is ninth from the front on the right hand side. Jeffrey Hemmings is eight and his brother Brian is number seven. Alan remembers playing on the island in front of his house and his mother coming out and saying: “if you hear a wailing sound come inside immediately” It was the start of the war in September 1939. He says that there was an air raid siren erected on the corner of Vesta Avenue and Watling Street with an ARP post. During the war , Alan Lawson remembers that soldiers from the Royal Signals were billeted with families all around, and then later they had boys from Hastings billeted with them as well. During this time, he says, the army occupied empty shops between the general store and the post office in Vesta Avenue and area behind his house which was then a field. 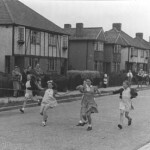 In 1948, prefabs were built in Tavistock Avenue where Tavistock Close is today. According to Val Goodyear-Burrow, who lived at number 79, they were built by prisoners of war. 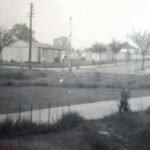 Eddie Few writes: I lived at 100 Tavistock where they started building prefabs. I like the picture of the street party. I am the first kid Eddie Few, the next kid is David Few the third is John Few, the second girl is Ann Few opposite us three boys. You may have known us. I used to do the milk round with Bunny Cooper who was the milk lady and I was allowed to rein the horse, but he knew where to go. I lived at 100 Tavistock 1967-1998. Since then she has passed on..